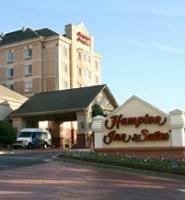 Welcome to the Hampton Inn & Suites Alpharetta-Windward. Treat yourself to the lap of luxury just north of Atlanta in Alpharetta, a culturally-savvy small town with an appreciation for nature. The Hampton Inn & Suites® hotel in Alpharetta-Windward, located in the prestigious Windward area, offers complimentary area transportation for all its guests. Indulge in a shopper's paradise at the North Point Mall, a 1.3 million sq. ft. haven of retail... Or venture into Historic Downtown Alpharetta and discover art galleries, antique stores and specialty shops in the tiny village of Crabapple?it's all easily accessible from our hotel in Alpharetta. Saddle up and explore the equestrian trails in Wills Park... Or pull on your boots and hike the nature trails on the Big Creek Greenway. Our hotel in Alpharetta is also close to the Andretti Speed Lab for miniature car racing. You can also take a short trip to Six Flags? Over Georgia, Stone Mountain Park or Lake Lanier. If you like, get some insider tips on the local attractions from the friendly team at our hotel in Alpharetta. Here at the Hampton Inn & Suites Alpharetta-Windward, we're passionate about taking good care of you. That's why we offer a broad range of services and amenities at our hotel to make your stay exceptional. Relax in our outdoor pool and enjoy the grill area! Our 600 square foot apartments offer full kitchens and separate bedrooms! Located in wooded surroundings, yet close to all the action! Check out our unique conference/banquet facilities! You cook or we cater, your choice! From GA 400 N. - Exit 11-Windward Prkwy. Make a left onto Windward, Turn right on Deerfield Pkwy. Take first right onto Morris Rd., then take first right on Old Morris Rd. and hotel is on the left.